I don't know about you but I like watching police detectives at work in foreign languages. Wallender springs to mind, in the original Swedish with subtitles. French tele doesn't seem to have discovered it yet, but thanks to my Sky Digibox, I can enjoy it unfettered by a dodgy dubbing into French. Yesterday evening, by pure chance my TWDB and I happened on an episode of Commissaire Montalbano, the Italian police series. It was being shown on BBC4, with subtitles. Set in the Sicilian town of Vigàta, the series is filmed in Ragusa, Punta Secca and Licata with scenery that has you itching to get on the next boat. 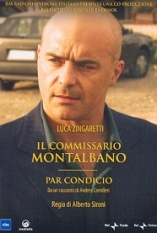 This evening, amazingly, France 3 was showing another episode of Commissaire Montalbano, dubbed. How bizarre is that? I discover it on Saturday evening and see it for the first time on French tele on Sunday evening. Quel coincidence! the fractious detective's character and manner encapsulate much of Sicilian mythology - brooding philosophy, whip smart dialogue, rugged beauty, superb food - and astute detective work. What is there not to like? I must admit, it was much better in Italian with subtitles. The character loses something dubbed into French, especially as French tele only seems to have half a dozen dubbing actors so you know all the voices already, most of whom you already associate with a particular film character. It's most disconcerting.